First of all, thanks to everyone who offered kind and wise words. I very much appreciate it. The trip home was everything I thought it would be, but I’m glad I went. The kids kept me busy, and I had a lot of fun playing with them. They loved having me there. They even asked if I could stay an extra day. It was exhausting, though. Between playing with them and grieving, I’m drained. I was supposed to go back to work today, but I got very little sleep Sunday night and didn’t really get a lot of rest during the day yesterday. I’m sure work is insane right now. I’m not up for it yet. I don’t know if I will be tomorrow, but I’ll give it a shot. Today is the first day I’ll be alone with my thoughts, aside from the drive up and back. I think I need the time for the mental sorting out of stuff as well as physical rest. 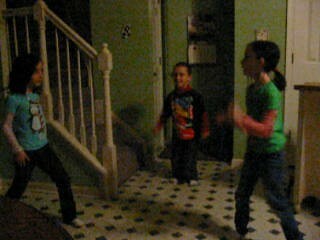 Here’s a few seconds of the kids dancing to Michael Jackson’s Thriller. I couldn’t get my camera to record more than a little bit at a time. I never use it that way, so I don’t know all the tricks. But this short clip is a pretty good representation of the whole.